Cash traded fed cattle were mixed this week. The five-area fed steer price for the week of August 11-August 18 averaged $117.54 for live sales, and $186.06 for dressed; respectively, up $0.63 and down $0.80. Total volume sold was up 18,000 head from a week ago and up 59,000 head from last year. Feeder steer cattle and calves were mixed across the U.S. this week. Oklahoma City 500-550 pound steers were $4.00 higher while heavier 750-800 pound steers were $2.00 lower. Mississippi pasture conditions were slightly better this week with 60% rated good or excellent, up 3% from a week ago. In Mississippi auctions, lighter weight feeders weighing 450-500 pounds were averaging $150.00, unchanged from a week ago, while heavy steers were averaging $123.00, down $4.50 from last week. Live cattle futures and feeder futures were lower this week. August live cattle were down $2.92 on the week and $21.18 lower than a year ago at $113.40, while December live cattle were down $3.30 from last week and down $34.10 from a year ago at 111.70. Feeder cattle were lower this week with August futures down $3.12 from last Friday and down $65.73 from a year ago at $145.95 while October futures are down $3.30 on the week at $140.95. Nearby corn futures are up $0.12 from a week ago at $3.34 while December futures are unchanged. Wholesale boxed beef prices are higher compared to a week ago. Choice boxes averaged $201.24, up $0.70 from a week ago. Select boxes ended the week with an average of $193.54, up $1.06 from last week. The choice-select spread narrowed slightly from $8.06 a week ago to $7.70 this week. 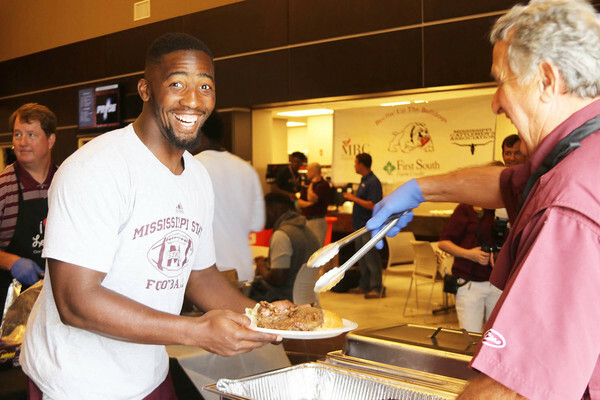 Friday, August 26th 11:00 a.m.
On Saturday after Fan Day, Mississippi State football players and coaches enjoyed a BEEF supper hosted by Mississippi Beef Council along with Mississippi Cattlemen's, and First South Farm Credit. Animal and Dairy Sciences Staff along with MCA members grilled the steaks and members of the MSU Collegiate Cattlemen's helped prepare the meal. Thank you to our sponsors: First South Farm Credit, Lee County MSU Alumni, Nunley Trucking, Alcorn Co-op, and MSU Animal and Dairy Sciences. Republican presidential nominee Donald Trump has named Mississippi Commissioner of Agriculture Cindy Hyde-Smith co-chairman of the Agriculture Advisory Committee for the Donald Trump presidential campaign. The committee will be charged with advising the presidential candidate on issues important to the American farmer, agribusinesses, and rural America. For the entire article in the Daily Leader click here. 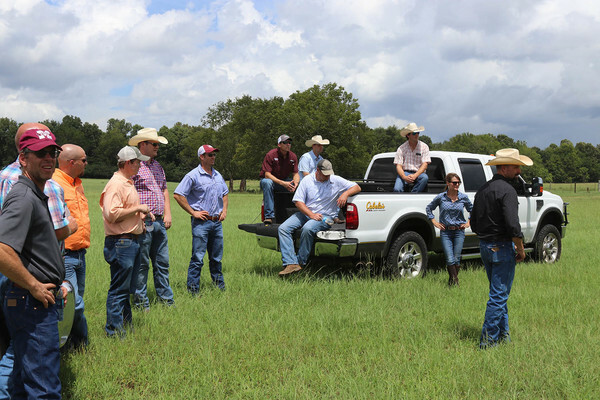 MCA Young Cattlemen's Leadership Series (YCLS) attended gathered in Starkville last week for a tour and visit with MSU Extension Administration Friday evening. 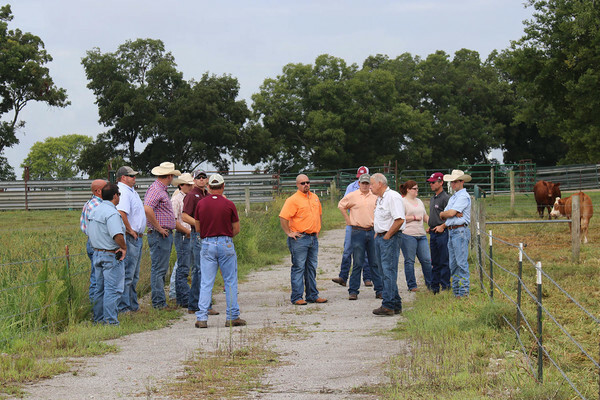 The Saturday tour included Little Creek Farm, Jacob Megehee Farm, Cow Creek Ranch, and Tanner Farm. If you would like to know more about YCLS please contact the MCA office. We are aware of cattle loss in Mississippi and are working to identify how specifically we can help those affected in Mississippi. The Mississippi Cattlemen's Association has also been contacted by the Louisiana Commissioner of Agriculture and Forestry Mike Strain regarding recovery assistance to victims of the massive flooding which has occurred in Louisiana. The need of human assistance is still great, and we encourage you to assist how and where you are led. There is also a resource available to help fellow cattlemen and women with hay, feed, or transportation. 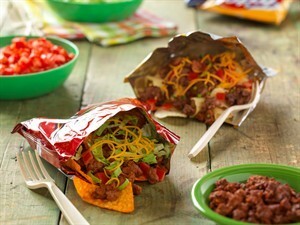 ​MCA will be delivering a load of feed and hay to the Gonzalas, Louisiana area this week. To donate please contact the MCA office. August 27th • 1:00 p.m.